Two games played in the FAWPL Southern Division this Sunday. Crystal Palace Ladies reached the final of the Capital Cup last weekend away to Queens Park Rangers Ladies this Sunday the two sides met in the league. The deadlock broken in the 28th minute as Ciara Sherwood struck from a free-kick to give Crystal Palace the lead. That was how it remained until half-time. Queens Park Rangers coming back to level the scores on 62 minutes, Kasha Petit scoring from a free-kick outside the box. Crystal Palace were quick to respond pegged back for just 2 minutes retaking the lead with Ellie Bales scoring to make it 2-1. The visitors holding on for the win the 3 points taking them to within a point of 2nd placed Charlton Athletic Women. Crystal Palace Ladies also announcing this week they have applied for a place in FAWSL 2 with will be known as the FA Women’s Championship from next season. In the other FAWPL Southern Division game played this weekend 6th placed Portsmouth FC Ladies travelled to Wales to take on Cardiff City Ladies. The sides going in goalless at half-time it was Portsmouth who went on the win the game in the 2nd half Daisy McLachlan scoring early in the 2nd period the 3 points make safe 6 minutes from time as Eilidh Currie netted the goal to give Portsmouth the 2-0 win. Move above Coventry United Ladies into 5th place in the Southern Division table. Coventry United Ladies complete the line-up for the last four of the FAWPL after they were successful away winners to South West Division One side, Plymouth Argyles Ladies on Sunday. Nikki Miles with the goal in the 18th minute to hand the Southern Division side the lead at half-time. Coventry doubling their advantage as the game moved on the hour mark with Amber Hughes on target with the goal. The result made secure 10 minutes later as Miles scored her 2nd of the day to put Coventry through with a 3-0 win. The semi-finals of the FAWPL Cup with take place this coming weekend Sunday 4th March (weather permitting) Coventry United Ladies will be away to Northern Division side Blackburn Rovers Ladies. In the other semi-final Lewes FC Women from the Southern Division will be away to Northern Division counterparts, Leicester City Women both currently 4th in their respective leagues. The pair met in the same fixture a year ago albeit in the FAWPL Plate, Lewes with the narrow 1-0 win then went on to reach the final and win the competition. One quarter final tie outstanding in the FAWPL Plate too, postponed last weekend Luton Town Ladies hosting fellow South East Division One side Milton Keynes Dons Ladies. Despite a great strike from Luton’s Zara Carroll the hosts found themselves trailing 2-1 at half-time thanks to goals for Vicky Holland and Heather McDonnell for Milton Keynes. Luton get themselves back on level terms with Natasha Fensome scoring a goal celebrating her birthday. The tie won with a late late winning goal Luton the side celebrating as Nicola Henman found the back of the net to send them into the last four of the FAWPL Plate with a 3-2 win. The first time Luton have reached a national semi-final too. Again like the FAWPL Cup the semi-finals of the Plate are scheduled to be played this Sunday 4th March. Luton Town Ladies will be at home taking on higher league opponents, Flyde Ladies from the Northern Division, whilst West Ham United Ladies will travel to Northern Division One leaders, Hull City Ladies. AFC Wimbledon Ladies already have a strong lead in FAWPL South East Division One extended that to 14 points with a big result away to bottom side Haringey Borough Women on Sunday. The visitors taking a very early lead Haringey credited with an own goal. AFC Wimbledon having a chance to double the lead from the penalty spot the effort was saved. Haringey came back to level the scores as they were awarded a penalty themselves, Brooke Hills scoring to make it 1-1. A busy start to the match. Wimbledon retook the lead in the 20th minute, Katie Stanley getting on the scoresheet. 2-1 quickly became 3-1 as Wimbledon captain Jess Trimnell scored from a corner. Georgia Heasman getting Wimbledon’s 4th goal as the half hour approached. 4-1 up at half-time Wimbledon extended their lead in the 60th minute as Stanley found the back of the net for her 2nd of the game. For much of the 2nd half Haringey held Wimbledon to 5-1 before a flurry of goals scored in the last 5 ten minutes Jordanne Hoesli-Atkins making it 6-1 on 81 minutes. Caroline Bisson scoring too to make it 7-1 with Rebecca Sargeant and Laura Quinn-Low scoring a goal apiece in injury time to see Wimbledon win 9-1. 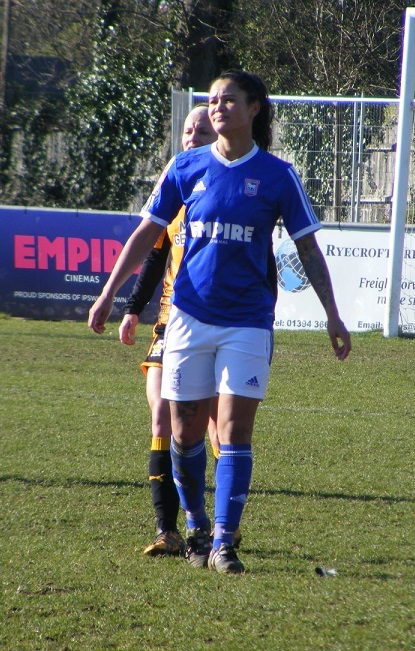 Ipswich Town Ladies are up from 4th to 3rd in the FAWPL South East Division One table with a home win against 6th placed Cambridge United WFC on Sunday. Women’s Football East was there to see a match that is usually close between the 2 sides, the case again the pace high not much time afforded on the ball led to some scrappy play. Chances at a premium, Ipswich Town opening the scoring in the 15th minute winning a corner on the right Cambridge not getting the ball clear falling to Natasha Thomas free at the top of the area she smashed it home to make it 1-0. Late into the 1st half an Ipswich goalkeeper, Sian Fagg fouled Cambridge striker Kelley Blanchflower inside the box to give away a penalty. Made up for it by saving comfortably against taker Amber Cantwell. A narrow lead for Ipswich Town at the break. Cambridge started brightly 2nd half however it was Ipswich Town who went on to double their lead, the ball played forwards Miagh Downey getting round the centre back to push the ball past the advancing keeper from the top of the area to make it 2-0. The game far from settled Cambridge working the ball well on the left got across into the top of the area themselves to find Cantwell who drove the ball past Fagg to make it 2-1. Closing in on the last 10 minutes a good run from Thomas saw her move clear into space left of the Cambridge goal and picking her spot lifted her shot up over the keeper to make it 3-1 and seal the win for Ipswich. A 2nd successive league win for Stevenage Ladies sees them climb up to 7th in the FAWPL South East Division One table level on points with 6th placed Cambridge now as they claimed the 3 points away to Actonians Ladies this Sunday. Paige Logie with a smart turn and volley inside the opposition six yard box on 28 minutes to give Stevenage the lead. Actonians levelling thing’s up 4 minutes from the end of the 1st half, Alessandra Barreca with the goal. The winning goal coming midway through the 2nd half Stevenage captain Donna McGuigan on target to make it 2-1. A heavy loss last weekend for Norwich City Ladies away to leaders AFC Wimbledon Ladies thing’s were starting to look daunting for the side 2nd bottom in the FAWPL South East Division One. The difference 7 days makes as Norwich came home with the 3 points this Sunday clinching the win away to Enfield Town Ladies. An early setback for the visitor as Enfield took the lead in the opening minute Katherine Long getting the goal. The 1st half moving into the final 15 minutes Norwich got back on level terms Aimee Durrant with the shot to make it 1-1. Enfield responded quickly Sheryce Slater getting up the other end to restore the hosts lead 4 minutes later. Back came Norwich to level the scores for the 2nd time 5 minutes left in the 1st half Durrant with her 2nd of the game to make it 2-2 the score at half-time. The winning goal coming on the hour mark. Australian, Brydie Siryi making her debut for Norwich getting the goal to make it 3-2 and secure the win for Norwich that closes the gap to 10th placed Denham United Ladies to 5 points. Norwich with 2 games in hand all to play for. This entry was posted in FAWPL Cup, FAWPL League Plate, FAWPL South East Division One, FAWPL Southern Division, The Round-Up and tagged FAWPL Cup, FAWPL Plate, FAWPL South East Division One, FAWPL Southern Division, The Round-Up on February 27, 2018 by WFEast.